The white, pink and gold RV-4 pictured below was built and test-flown by Bobbi Boucher over a period of six years - all 14820 rivets; no quick-build for this girl! The plane first flew in January 1998 and has since accumulated 402 hours. N2QT is powered by a 160 horsepower Lycoming O-320 turning a fixed-pitch wooden two-blade propeller by Aymar-Demuth. Bobbi knows her engine inside and out - she built it up herself. Bobbi holds a Comercial Pilot certificate with ratings for Single and Multiengine Land and Seaplanes, and is also a Certified Flight Instructor. 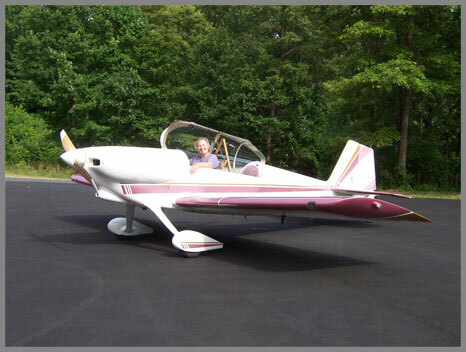 She started out flying sailplanes, and first soloed in 1973. She spent six years in the Navy working on P-3s, which enabled her to get her Airframe and Powerplant ratings. Thanks to the Navy, she was also able to get her Flight Engineer rating. Bobbi also went to Africa at the request of the World Wildlife Foundation to build and fly a Beaver RX 550 ultralight aircraft for the foundation. She has also done a firewall-forward Lancair 320, and has built a Super Lancair ES with an IO-550 up front. Bobbi has flown her RV-4 in five AirVenture Cup races, making her the most experienced female pilot and solo pilot in AirVenture Cup history.